Andrew Palomares began his dance career in 2002 with a Mexican folk dance group. 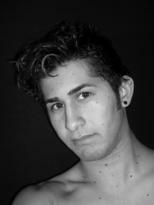 In 2010, Andrew graduated from the CSULB Dance Program with a B.A. in Dance and he continues to perform professionally with both contemporary dance and Mexican folk dance companies. He has attended prestigious dance workshops such as the San Francisco Conservatory of Dance Summer Intensive, where he trained with Summer Lee Rhatigan, Alex Ketley, Christian Burns, Chiharu Shibata, and Batsheva company dancer Bobbi Smith. Andrew has had the opportunity to work with many talented choreographers, including Michele Jenkins, Sophie Monat, Keith Johnson, Dorcas Román and Lorin Johnson.